One year ago, today, a massive hole was left in the middle of me. In a single moment, laughter and joy, happiness and the smiles that go with it, were all taken away. You never fully realize, then your little furry friends are alive, just how much of a part of you they are. The not only shape you into better, kinder people, but they change how you see the world. Mokey T. Fraggle began her life in this world on December 2nd, 2006, in Sequim, Washington. She was tiny, barely more than a small potato of brown and black fur. 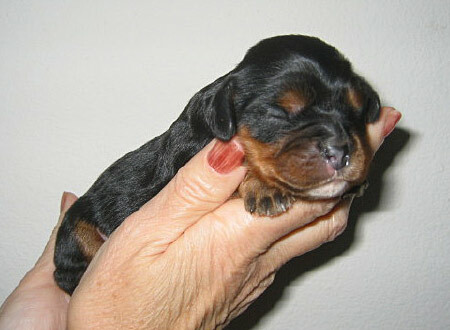 She fit comfortable in the small hands of her breeder, Marcia Whitcomb. Joann and I had recently gotten back from our honeymoon, and decided that it was time for children. Well, fuzzy children with tails. 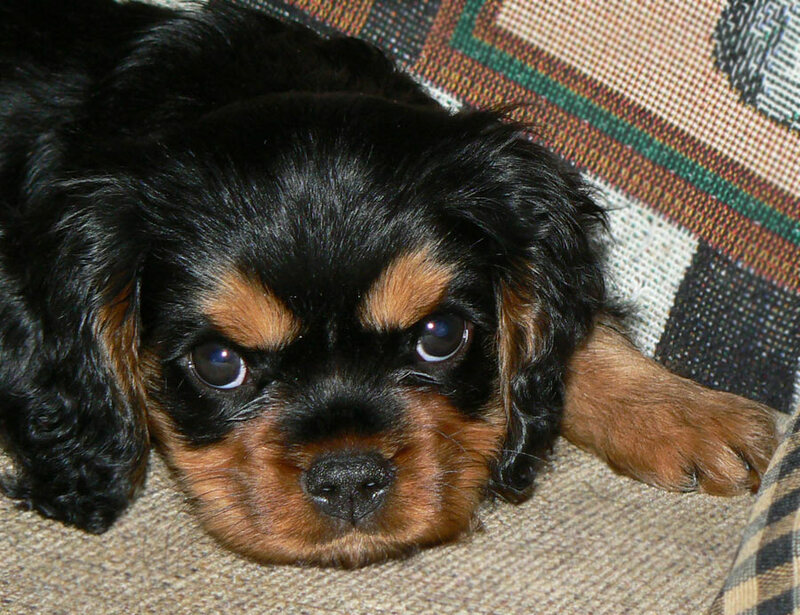 And after stalking the dog shows all over the Sound for the better part of 4 months, checking out breeds and breeders, and reading books and internet posts about the breed we’d selected, we decided that the Cavalier King Charles Spaniel was the dog for us, and further that we were going to buy one from Marcia. Marcia very kindly took pictures at 2 days, 2 weeks, and 5 weeks, of our little Mokey (though she didn’t yet know we would name the pup that), and at 7 weeks we drove out to Sequim to see the dog for the first time. After a ferry ride, and a fairly uneventful drive, we arrived at the house where our puppy was born. After a brief chat, a whole bucket of puppies were brought out to say hi, and we were overrun with tiny tails and itty bitty legs, and little fuzzy bundles of energy and needle teeth. It was honestly one of the happiest moments of our lives, up to that point. The pups were all ridiculously cute, and Mokey was the star of the show. She would romp and play super hard for 5 minutes, and then like a narcoleptic she would crash into sleep for 10 minutes. Then she’d wake, and the cycle would start all over again. However, all of the puppy play and random petting as she would fly by wasn’t what cemented that this little dog was mine. The earthshaking event that tolled the bell letting the universe know Mokey had found a person was both simple, and incredibly complex. Shortly after one of her little “play, then crash” episodes, she was asleep on my arm. Her little bum was touching my wrist, and her head was in the crook of my elbow. She was happily konked out on her back, tiny feet sticking into the air, with not a care in the world. She’d put herself completely in my care, and I knew that was a very great honor. And then she woke up, and upon rising, she reached her small noggin up, and gave my the tiniest kiss on the nose. This was the beginning of a love affair that lasted the next 9 years, and something for which life had never really prepared me. Mokey became Joann’s and my constant companion. Where we went, she went. And if she couldn’t go, neither did we. It was really that simple. We stopped going to movies, stopped eating out. We went to the grocery store in shifts, one person staying with Mokey while the other bought all the items on the list. If we went to any place that might even remotely allow dogs, even if it was by failure to post anything saying they didn’t, Mokey went in with us. 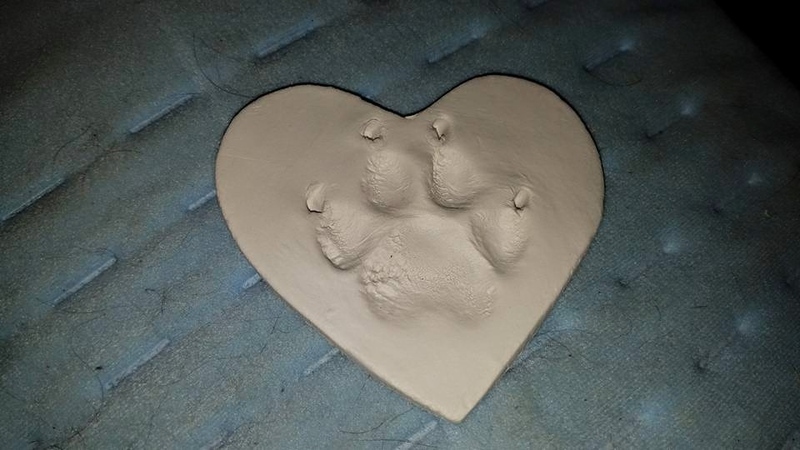 She was with us every step of the way, every and night, and there was never a thought of how much we had changed our lives to fit her into them. She was our first puppy, and we did many things wrong. She was a picky eater as a pup, and in desperation to get her to eat something we even started giving her treats as food. Her diet was so poor that we inadvertently caused her to get pancreatitis. We knew this, because one night around 2 or 3 in the morning, we woke to the sound of our little bear screaming. Actually screaming. Not whining, or whimpering, but shrill, loud, pain-filled screams. She was two years old, and we’d already given her her first major horrible moment. From that moment on, for the rest of her life, we were incredibly careful with her diet, checking fat contents and more, to make sure she ate as healthy as she possible could. For the next couple years, Mokey embarked on her professional life. She trained hard with Joann, and the two of them became a Therapy Partnership. Mokey was a certified Therapy Dog, and she and Joann would travel every weekend or two to a nice little retirement community in West Seattle to do their best to make the lives of others better. It always took a lot of energy from Mokey, but she absolutely loved doing it. And so her life was awesome, as always. However, we had missed yet another potential marker for disaster. We didn’t realize that it was possible for our little puppy to get… Bladder stones. She wasn’t much more than 4 years old, and she was constantly at the vet for various infections, and we couldn’t for the life of us figure out why she had them. Finally, after x-rays and ultrasounds, we found out that she had tiny little stones in her bladder, and this brought about her first (since getting fixed) major operation. She came through it perfectly, and at that point her diet changed even more than previously. She was now going to be on a new prescription diet for the rest of her life. Thankfully, Mokey thought the new food was the bomb, and for years things were awesome. We had brought a new little monster into the house when Mokey was about two and a half, in the form of Ziggy. Ziggy was a holy little terror, and Mokey loved her to bits. They were best friends, and romped together everywhere. Ziggy was so hypersonic, that Mokey calmed a bit (though she was never what one would call a crazy pup) in her new role as Leader of the Pack. Shortly after Mokey was six, we rescued and adopted Basil, and Mokey’s life was never the same. They played, they romped, they all three were as happy as could be. 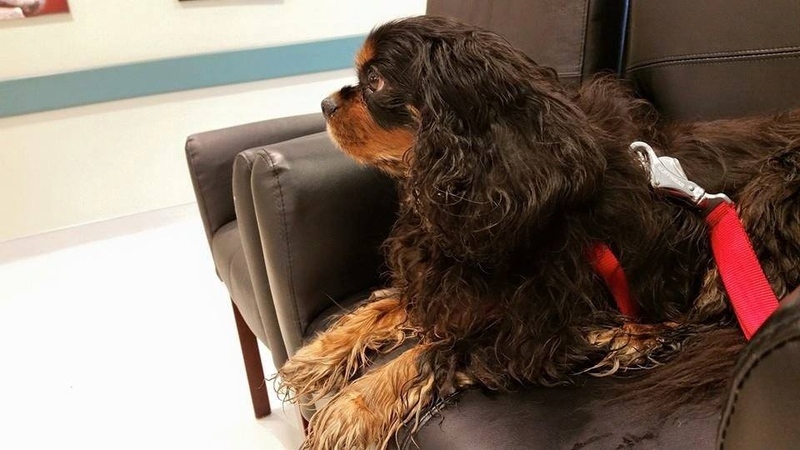 Around this time, we decided it was time to start getting Mokey regular heart checkups, as we knew that Cavaliers were prone to various heart problems, and we wanted to be proactive to give her the longest and best life she could have. So we got all three of them tested. Ziggy and Basil had negligible results, both had tiny murmurs that haven’t progressed noticeably over the years since then. But Mokey’s results were not as good. She could go on medication, and live perhaps another 8 or 9 months. She could have a pacemaker implanted, and with proper care and routine checkups and daily medication, could perhaps live for many years. There wasn’t really even a choice to be made. Joann and I looked into places to get pacemakers implanted, and found the wonderful doctors at the Seattle Veterinary Specialists clinic in Kirkland, Washington. Her doctor was a nice young cardiologist, who was equally stunned at her apparent lack of admitting that there was anything wrong. We moved things along as fast as we could, and I think it was October of that same year, 2013, that she had her operation, and was fitted with her very own pacemaker. It made an odd little lump on her shoulder, and came with all sorts of warnings about how we had to make sure she didn’t play too much, and how she couldn’t exercise very much, and how she shouldn’t travel over the passes, because the change in elevation would be bad for her, and in general how her life was now very different. Mokey didn’t care about any of that. She was just all about love and happiness. For the first month after her implant, we were to keep her as calm as possible (she had tiny little puppy calming pills to help), and absolutely keep her from jumping on anything. Since she had little stairs to get on the bed, this didn’t seem a major problem. That first night, I woke in alarm because my little bear wasn’t in bed with me. I got up, and started to search the house… and found her sleeping happily on the couch. Where she’d jumped up to get to. This, really was our only ‘scare’ at that time, as from then on we kept her on a leash for bed time, and we kept absolute sharp watch on her, and she healed nicely and got back into her daily life. Over the next three and a half years, she was healthy, and happy, and still loved the world at large. She had moments where she would give us scares, like when she decided that prescription diets were horrible, but we overcame all of these things. She had checkups every three months, and she seemed to be adjusting to pacemaker life quite well. When she was about nine years old, her heart began to develop more complications. She had begun to suffer from Mitral Valve Disease (where a little butterfly valve in her heart wouldn’t close properly, and fluid would build up and gradually overflow and backup into her lungs), and she’d also started to show the signs of Dilated Cardiomyopathy. Her heart’s walls were simultaneously thinning, and growing harder, and her heart was beating wrong – blood wasn’t flowing out the fast enough to keep her properly oxygenated. Adjustments were made to her pacer to get her heart beating faster to counter the oxygen issues, and medication was introduced to help with the fluid in her lungs. And through it all, Mokey was Mokey. She was perfect, and always sweet, and acted like everything would be perfectly ok.
On June 12th, 2016, around 4 or 5 pm, Mokey suffered a heart attack while relaxing on the couch with us. She screamed and thrashed, and did not go easy into that good night. She fought, and fought, and I held her in my arms as she passed from this life. Joann and I were inconsolable, and stunned, and beyond words. We bundled up our little bear, and drove her up to Kirkland, to SVS. Mokey’s life had been spent giving love and help and happiness to others, and in her death she still had one more bit of giving left. Her pacemaker was donated back to SVS, to help with another dog who would need it, and Mokey was laid to rest. On this day a year ago, our hearts were crushed as our little friend left this world. There will be other dogs in my life, and in fact in the year since Mokey passed we’ve already welcomed little Buddy into our lives. So there will be other dogs. But there will never be another dog like Mokey. Mokey T. Fraggle, I sincerely hope there is some eternal existence for you, because for the brief time you made my life better, you deserve an eternity of happy puppy times. I love you, my little bear.